This post, however, is about cuisine that’s 180 degrees from my grandma’s from-scratch dinners. Since they don’t celebrate St. Patrick’s Day, the Japanese have no Shamrock Shake, but this spring McD’s offered a Japanese take on the green classic: matcha (green tea) flavor. At 120 yen it’s a fraction of the cost of a green tea Frappuccino; unfortunately, it’s a fraction of the flavor, as well. The shake tasted less like green tea and more like those soaps that are supposed to be green tea-scented, in some universe where green tea smells like cheap perfume. The greenness of the shake also left something to be desired. Things made with actual matcha are a vibrant green; this shake looked more like it had been flavored with green tea dregs. 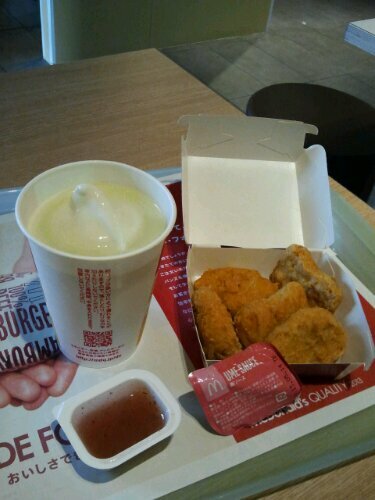 The other seasonal offering was plum dipping sauce for McNuggets, which I haven’t had in ages. The plum in question is the Japanese plum, or ume, which is one of the first flowers of spring, though cherry blossoms get all the glory. The plums are quite tart and are usually pickled (umeboshi) or used for plum wine. So the dipping sauce wasn’t the sweet plum sauce that comes with Chinese duck, but rather a sour-salty version. It made for a refreshing (in a slightly artificial sort of way) contrast to the fried nuggets.